Title: Tressa: The 12-year-old mum: My True Story. Genre: health, family and lifestyle, families and parents, motherhood, pregnancy and childcare, women's health and lifestyle, biography, autobiography, memoir, true story, nonfiction. I bought this book as a treat for myself. I highly recommend this book I would tell people not to judge the book by it cover or title . Book dedication: this book is dedicated to my little girl Annie, I love you with all my heart and always will, my life will be complete the day I meet my sweet baby once again. This book has 276 pages and 27 chapters in it. Some say the world will end in fire, some say in ice. From what l have tasted of desire I hold with those who favor fire but if it had to perish twice, I think I know enough of hate to say that for destruction ice is also great and would suffice. - 'fire and ice' by Robert Frost. I am walking along the woodland tracks in polkement country park, ten minutes from my house. It is beautiful here – the sun streams through the trees and dapples the ground with bright beams of light, picking out the stones and rocks by tinkling stream at my feet. Here it is peaceful and quiet. I come here a lot – especially when the noise of the world gets too loud. I walk through the dense woodland, listening to the babbling of the river at my feet and suddenly I feel calm, and I think of you. The fact is, you are never far from my thoughts. Every day, you are the first person I think of when I wake up and the last person in my mind as l drift off every night. You are the beating pulse of life. In my cupboard I keep the clothes you were wearing when you were just a wee baby. The pink and white babygros I dressed you in, the crocheted yellow cardigans that kept you warm. Everyone says I should get rid of them – but I can not. I suppose I never really learnt how to let go of you, and yet, these words are all l have now. According to your adoptive parent's wishes, we are not allowed any physical contact, and though at the time I felt cheated, today I understand, you see, I have grown up abit since we last meet – when you were just 2 years old and I was fourteen. I have come a long way and though I know I have still got a whole mountain to climb, I feel it is time to tell you a little about me, my life and why we are apart. Because, Annie, my beautiful girl, I do not want you to ever think that I did not want you. I did, very, very much. Alot was written about me back in those days a lot of things were said that just were not true, it is funny how people you have never even met can form an instant opinion about you just because they have read something in the paper. Twelve-year-old mum! - it made a good headline. It was not such a good life. But people did not know the truth back then – they said horrible, hurtful things about me. Later, I realized that I had been used, taken like a lamb to the slaughter. But l am not angry anymore and suppose I do not care, about those people. I have learnt to accept what happened to me in the past and moved on with love in my heart. Here is the truth: Annie, I always wanted you, and l loved you with all my heart. No, I did not want to give you up and even though I was very young, I knew l could take care of you if they just gave me the chance so l fought. I fought all the way to court and in the end the judge convinced me that I was not doing the best thing for you. He said I was being selfish and he was right – I could not give you the life you deserved. I wanted you to have a better life than l had – but I could not give you that. So instead, I gave you away to someone who could. Annie, this is my story, and it is yours too. I hope that it helps you to understand what happened to us both and why I hope that you can forgive me and perhaps, one day, we can be apart of each other's lives again. For now, I just want you to know that I love you – I always have and I always will. You are forever in my heart. - mum x.
Synopsis: nobody knew the truth. For all those years while people judged me, I protected those closest to me. Not it is time for the real story to be told. It is time for healing and forgiveness; Tressa Middleton made UK history when she became Britain's youngest mum in 2006 aged just 12 years and 8 months. Her case provoked shock and outrage – but the truth behind the headlines was far sadder than anyone could ever have imagined. Born in to a life of poverty and neglect, Tressa was forced to grow up fast when she was taken in to care at just four years old. She was returned to her mother's chaotic world but by the age of seven, she was being abused by her own brother and at 11 years old she fell pregnant with his child. For years she kept his dark secret in an attempt to hold her family together until the truth threatened to destroy her completely. In the years since the birth, Tressa has gone through more pain and turmoil than most adults experience in a lifetime – yet today she survives a brave, strong and compassionate young woman. Now, for the first time, Tressa Middleton tells her own harrowing yet poignant story – a story of hop, forgiveness and above all, love. Review: I found this book really easy to get in to and harder to put down once l started reading it. This book was heartbreaking to read. This book made me want to cry. I was hooked on this book after just reading the first few lines of the prologue. It was sad to read that Tressa's father hit her mother and the only way her mother could get away from him was to put her children in to care which was the hardest decision any mother had to do so she could get away from her abusive husband. I was sad to read that Tressa was abused from the age seven. It was sad to read that she was raped at 11 years old by her brother and she got pregnant with his baby. Tressa wanted to keep her baby I was sad to read that Tressa was used by the papers. I think Tressa would have been a great mother if they had given her a chance with Annie. Tressa sounds like she loved working with children. It took me less than two days to read this book I could not put it down I just wanted to read about Tressa and Annie. I was glad Annie survived when she was born because her lungs was underdeveloped. Jason met his daughter in the hospital when she was in NICU. Tressa's family should have believed her when she told them what Jason did to her and when the DNA test come back saying Jason was Annie's father. They should have not turned against her when she needed them most. I was sad to read that Tressa tried to commit suicide I was glad Tressa had told the truth about who Annie's father was. Tressa made the hardest decision to let her beautiful daughter go so Annie could have a better life Tressa knew she could not give her. Tressa was heartbroken knowing her mother lost her sister and two brothers even though Tressa kept the abuse a secret so she did not lose them because Jason told Tressa that if she told their mother and social workers their mother would lose them all. I was sad to read that Tressa's father picked his girlfriend over his daughter and Tressa got on heroin. I was happy to read that Tressa got off drugs too and she met a guy named Darren he was on drugs too but they got off them together. Tressa got pregnant again but she lost the baby and her mother within a week which was upsetting to read. Jason was out of jail for the funeral and he was not aloud near anyone under 18 after what he did to Tress. Tressa sounds like a very brave person after everything she been through. I hope one day Tressa and her daughter, Annie are together again. I hope one day Tressa's brothers Ollie and Kai find her. Tressa has her mother's ashes with her as Jason is back in jail. This is a great book but upsetting and heartbreaking. Tressa is very brave telling her story. I am glad someone who makes her happy and she kept pictures of Annie and the clothes Annie wear when she was a tiny baby. I can not put in to words how great this book is l would tell people to read it for themselves to know how great it really is. I wish l could rate this book more than five stars because it is worth more than the five stars I rated it. I hope Annie has the best life and future that Tressa would have wanted to give her. It was horrible that Tressa was called all sorts of name because of her past. Acknowledgements: firstly, I would like to thank – Katy Weitz – if it was not for you, I would not have had the opportunity of reading this book for Annie so thank you for everything you have done. I would also like to thank our publishers, Blake, Andrew Lownie my literary agent and everyone who have worked on this book – it means so much to me that you all gave me the chance. I would like to thank Annie's adopted parents for giving her the upbringing that l could not and making her in to the person she is today – a very big and heartfelt thank you. I would also like to thank all my workers for not giving up on me when l needed help the most, you did not have to keep giving me all those chances, but you did and without all your amazing help I do not think I would have been able to get to where l am today – a very different place than before. A very big thanks goes to Margaret Scullion and Laura Mitchell – without you both my life would not have been worth living even the times you were very strict with me – I know I needed it and it probably helped to shape me in to the person I am today. Thanks to everyone else who supported me through the years – it means a lot to know that people do care and want to help, so thank you. Finally, words can not express my gratitude to Darren – the person who has had faith in me, and given me care, love and understanding when I needed them. I thank you from the bottom of my heart. 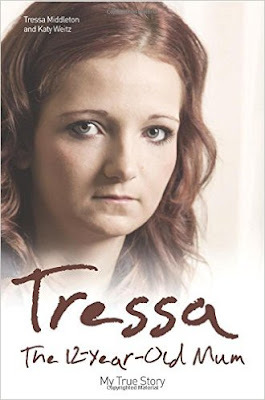 About The Author: Tressa Middleton attracted huge press coverage aged 12 when she became Britain's youngest mum – but the real story behind the headlines was far more complicated and heartbreaking. Tressa was the third child of four born to an absent father and an alcoholic mother who were regularly taken in to care. Tressa was more like a mum to her youngest sister and later to her mother's young sons by other men. The abuse by her brother began when she was seven but he used the family's instability against her. He said that if she ever told, all the children would be taken permanently in to care and they would never see their mother again. To protect them she kept his dark secret. By now her mother Tracey was a heroin addict and unreachable to Tressa. Almost inevitably, she followed her mother down the road of addiction. However, by 2011 she was determined to turn her life around and she has been clean for years. She says ' I was raised in darkness and fear. Motherhood at 12 was hard but far harder was the loneliness of keeping my brother's secrets. Not l want to share my story to help others overcome fear in their lives'.